I start by taking the dough out of the refrigerator to warm up just a bit. I don’t want it to get too soft, but I do need the dough to be fairly plastic, and at refrigerator temperature the butterfat is just too stiff. Meanwhile, I’ll choose a pie dish or plate to make this recipe, a chicken pot pie. The instructions call for a 9″-by-2″ deep dish metal or glass pie plate, or a ceramic pie dish; the accompanying illustration shows a ceramic dish with fluted but upright sides. I don’t have anything that looks like that, but I figure this deep, fluted stoneware dish is probably going to be pretty close in capacity. 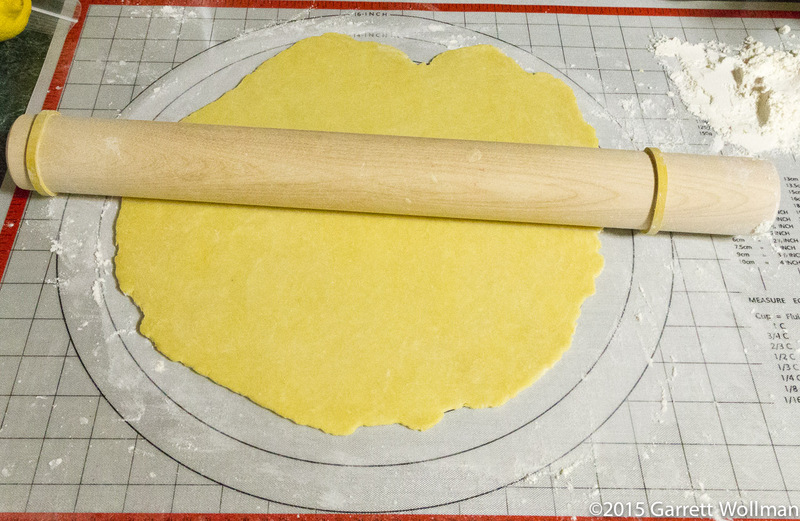 For rolling out the dough, I use this pastry mat, which is a lot easier to clean than my laminate countertop, but you can use any surface that’s actually large enough to fit the finished diameter of the dough and your rolling pin. 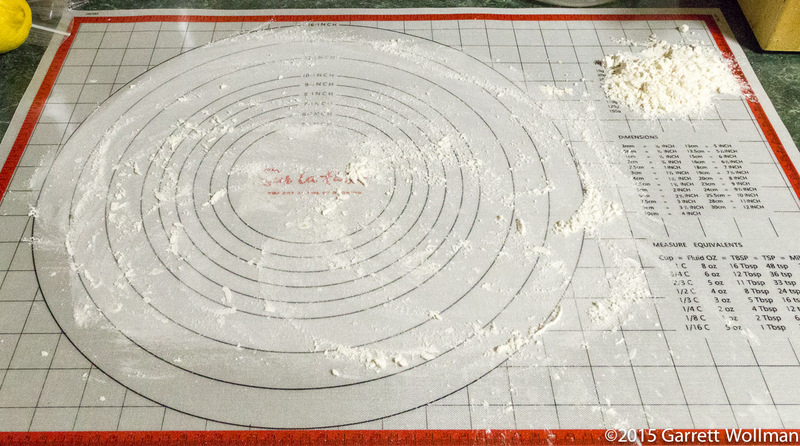 The pastry mat has the advantage of a set of concentric circles that help you gauge the diameter of your dough without pulling out a measuring stick all the time; I’ve also seen wooden boards with similar markings. Whatever surface you use, it will need to be well lubricated, usually with flour, and you should keep a tablespoon or two of additional flour close at hand to apply to your hands, your rolling pin, and the dough if it should start to stick. Always start by sliding the dough (which you should previously have formed into a disk, prior to its rest in the refrigerator) around on the floured surface a bit, on both sides, to give it the initial bit of lubrication. You’ll note here that I’m using a wooden dowel as a rolling pin — I use the J.K. Adams maple rolling dowel — but you can use whatever sort of rolling pin you’re comfortable with. Make sure to grab some flour in your hand and rub it along the length of the rolling pin — this will help keep the dough from sticking as it gets thinner. 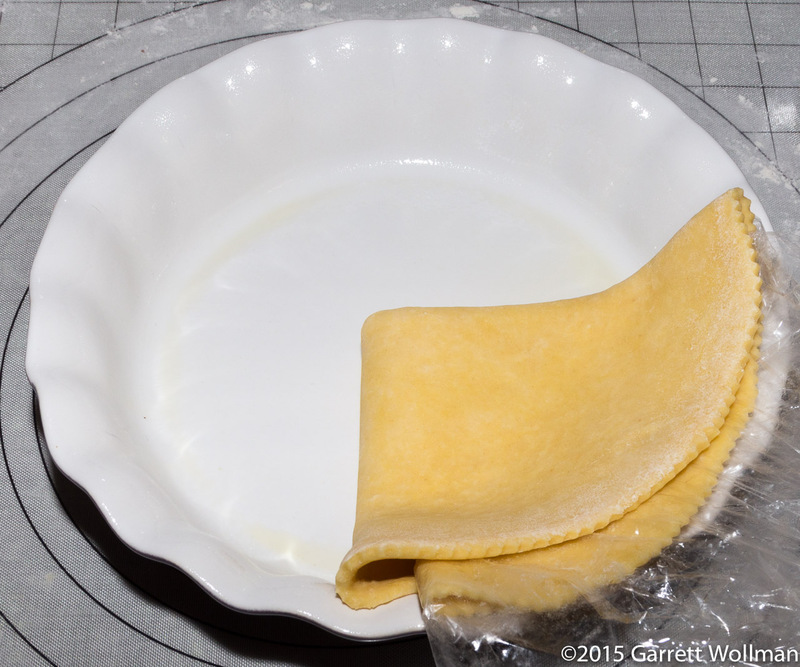 As sometimes happens, the dough was still a bit firm to work with when I was ready to start rolling, so I used my rolling pin to literally beat the disk of dough until it became a bit more pliable. (You’ll sometimes see chefs do this with butter, too, if it hasn’t quite softened enough.) If your dough is already soft, skip this step. 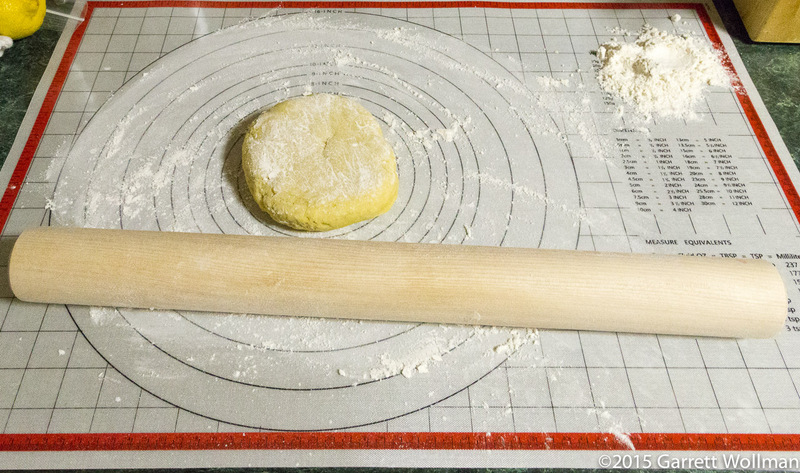 To roll out the dough, place the disk in the center of your work surface; put the rolling pin straight across the disk about 1/4 of the disk’s diameter from the near edge, and push the rolling pin away from you with an even motion. When you reach the far edge, pick up the entire disk and rotate it 1/8 to 1/4 of a turn, and repeat until the desired size is reached. After rolling the dough out part of the way, I put rubber spacers on the ends of my rolling pin. I’m not sure what the proper name for these things is, and I don’t remember where I bought them, but they’re just stiff little rubber bands in calibrated thicknesses — mine are 3/8, 1/4, 1/8, and 1/16 inch — and they can be a real help when rolling out dough like this. Most recipes will give a desired thickness of the dough; this recipe says 1/8 inch. You can see here how the spacers work. Without spacers, as I’m rolling out the dough, the downward force I exert on the rolling pin varies depending on the angle of my arms — I press down harder when my hands are closest to my body. That has the effect of making the edges of the dough thicker than the center, which is undesirable. With the spacers, the rolling pin can never get closer than the specified distance from the work surface, no matter how hard I push down, so I can keep on rolling and eventually the entire dough disk will have a uniform thickness that’s just right for the pie I’m making. Unless you’re really short on space, a wider rolling pin is almost always better than a narrow one. When using the spacers like this, it’s important that the spacers be at least far enough apart to fit around the dough itself, otherwise you’ll be running over the dough and defeating the purpose of the spacers; I had this problem with a previous rolling pin, which was a tapered French-style pin. 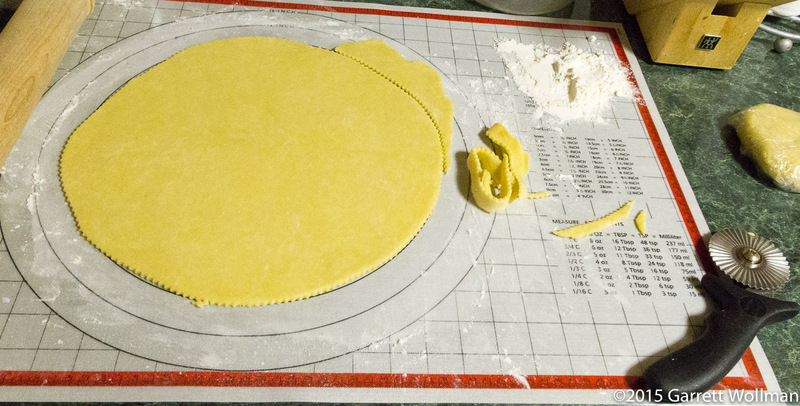 If I didn’t have the nice size guide on my pastry mat, I could have actually set the spacers using a ruler to the precise diameter I needed — for this recipe, 12 inches (30 cm). 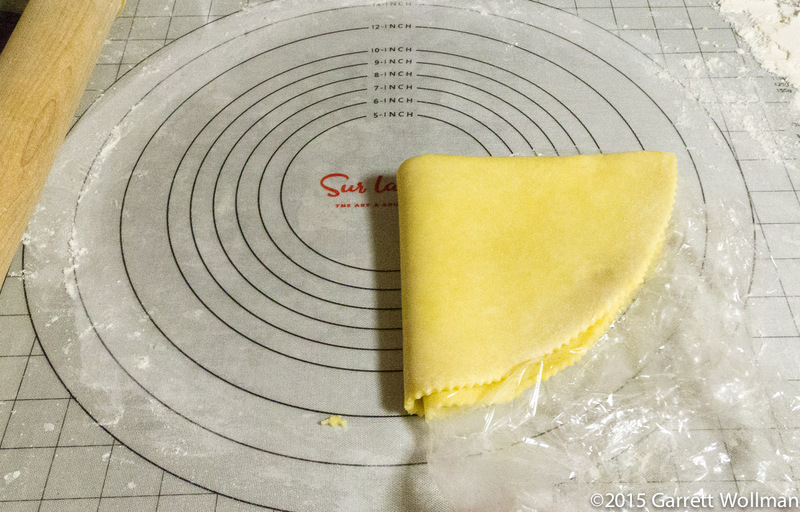 Using a pastry wheel (not necessary, a paring knife works just as well, but the result isn’t as pretty) I cut around the pastry disk to trim off any excess. I’m lousy at drawing circles so I didn’t get it quite even, but it will do. 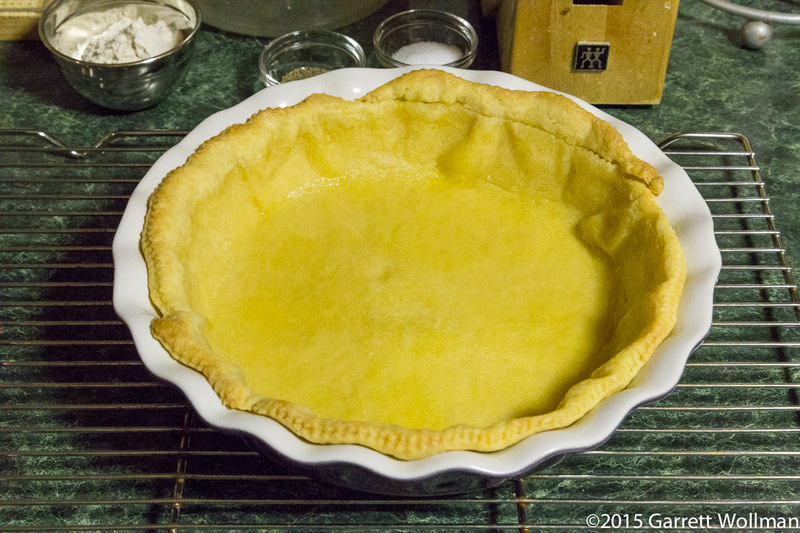 Now to get the pastry into the pie dish. 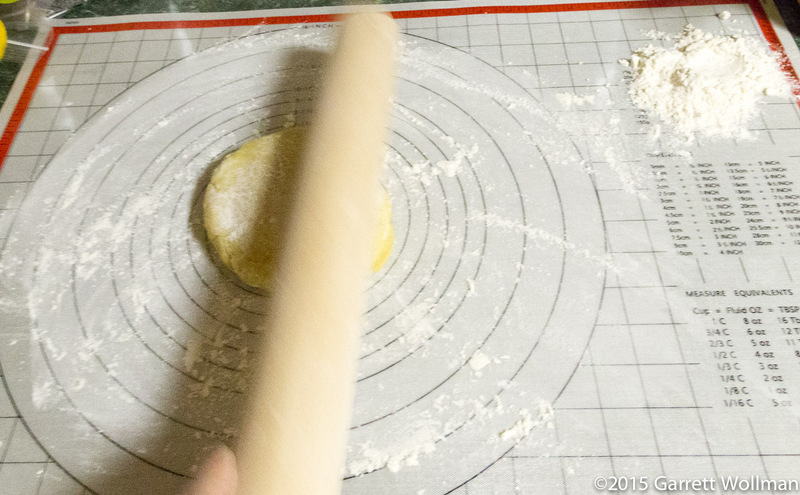 The standard way to line a pie dish with pastry involves rolling the dough onto your rolling pin to transfer it. I’m going to show an easier way to do it. Simply take a bit of plastic wrap (I saved the plastic that I had used previously to wrap the dough when it was in the fridge), and cover half of the dough disk with it. Then fold the disk in half as shown above. 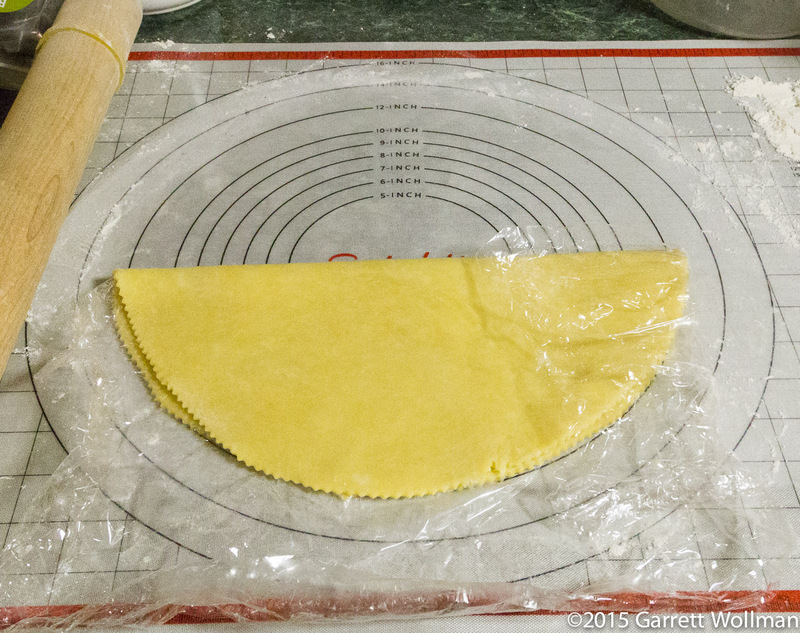 Now fold the half-disk in half. Prepare the pie dish with butter or baking spray and place the quarter-folded pastry round in the dish, taking care to align the point of the folded pastry with the center of the dish; then unfold. 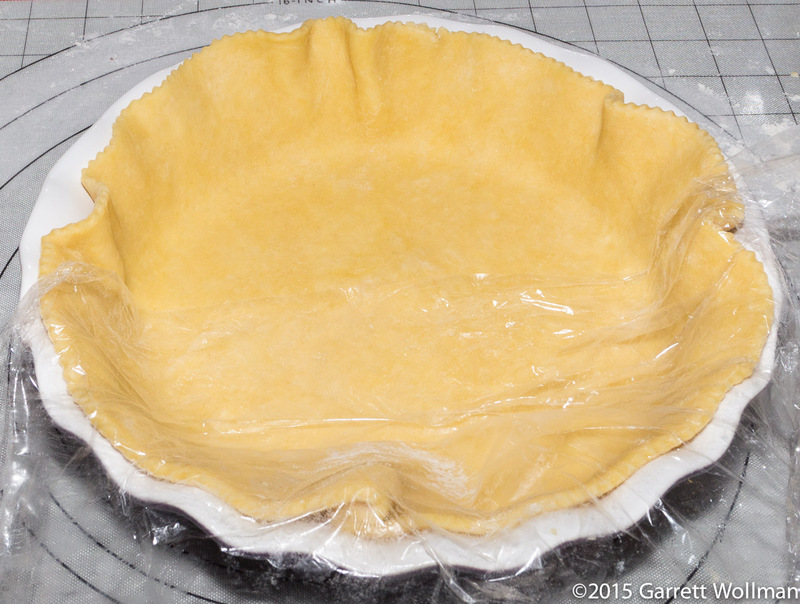 The pastry is now perfectly centered in the dish. Going around the circumference of the dish, carefully lift the edge of the dough and ease it down so that there are no air pockets under the pastry. In a fluted dish like this, make sure to press the dough into the flutes so that it makes full contact with the dish all the way around. 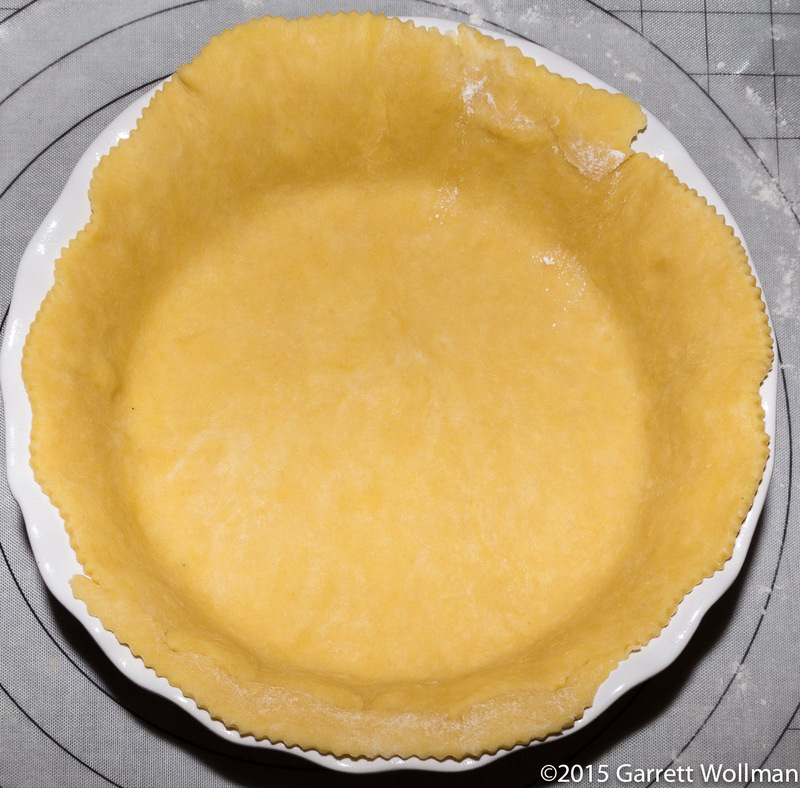 If this were a regular pie plate, I would have a good bit of extra pastry which would need to be trimmed off, and I’d be leaving about a ¼” overhang to tuck under the edge (and possibly crimp). You can see that I (somewhat clumsily) added back a bit of the dough that I had previously trimmed off, because the pastry was a bit short on one side. This almost never works, because the flour that I used to keep the dough from sticking to the rolling pin also keeps it from sticking to itself! At this point, the pastry has been worked quite a lot and needs to go back in the refrigerator to relax for at least another half an hour. I read ahead in the recipe once again to see what was required of the top crust, which would be made from the other piece of dough. 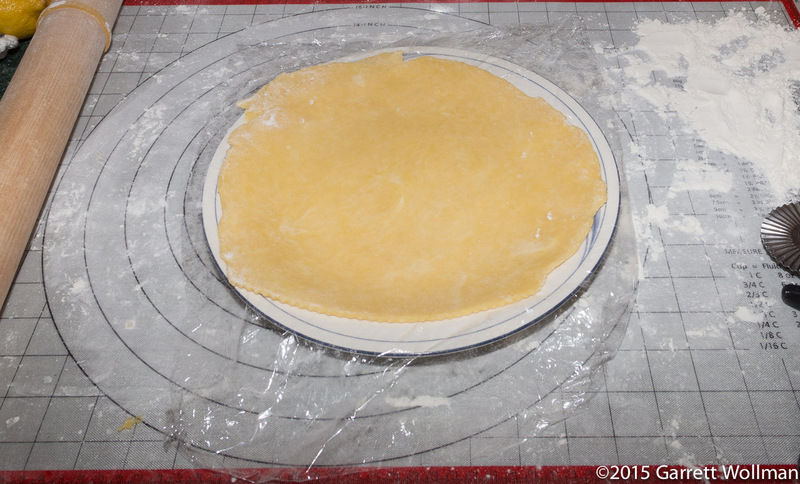 It was to be a simple 10-inch disk, and since my kitchen is quite small I rolled it out ahead of time so that I could get the counter space back to prepare the pot pie filling. I just put it on a sheet of plastic on top of a plate and stuck it in the refrigerator until I was ready. 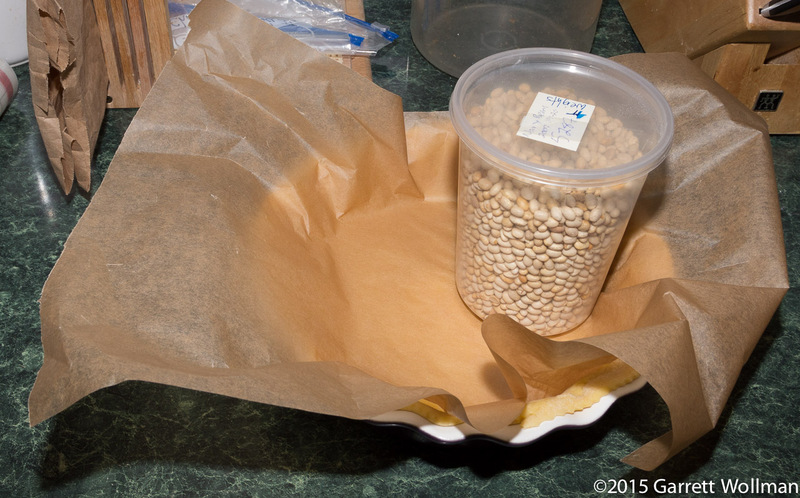 This recipe says to use baker’s parchment to separate the weights from the dough. I don’t like this (but did it anyway specifically for this demonstration) because parchment is much less deformable than aluminum foil (and isn’t really reusable, either, unlike foil). That means that it can be really hard to get the pie weights to conform to the shape of the pie shell. The gap illustrated here would not exist if I had used aluminum foil. (The downside of foil is that it needs to be sprayed with oil to keep it from adhering to the dough when you remove it.) The center of the crust doesn’t need as much weight on it, so the weights should be piled up towards the edges rather than heaped in the center of the dish. And finally, this is the fully blind-baked and cooled bottom crust. Note how the patch I attempted to make has failed: the extra dough I added never adhered properly to the rest of the crust and is now sitting loose atop the far edge. I’ll be back with a writeup of the pot pie itself shortly! 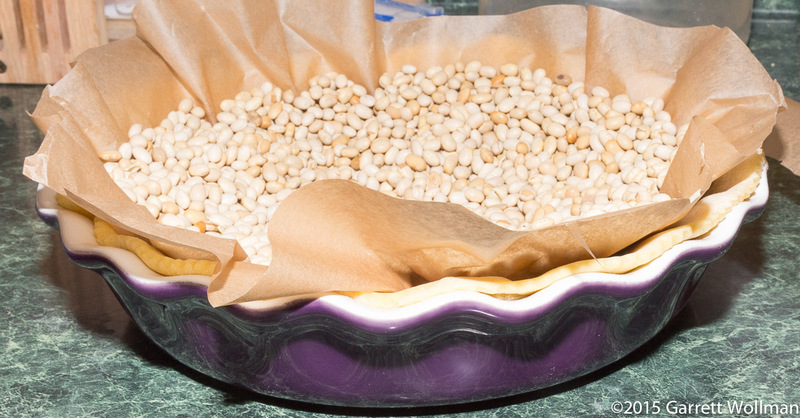 Gallery | This entry was posted in Food and tagged Joanne Chang, pie, pie crust, pie dough, pot pie, recipe, tutorial. Bookmark the permalink.